This weeks bloggers challenge was to use punches on your cards. I've got a special guest (my mom) on my blog today - sharing her "get punch" challenge card with you. Mom doesn't blog, but she's a talented stamper - I told her she could send them to me and I'd share them with you. After all the bad storms that rolled through our area last night, I didn't know if I'd make this weeks challenge. I've never seen so much rain come down in so little time. My husbands work van was literally vibrating in the driveway, the pool water is overflowing and wouldn't you know it at exactly 10PM, the sump pump decided to die! Of course all the stores are closed, the 24 hour places are not picking up their phones. Good thing everything is in plastic totes. DH left at 4:30AM to get to Menards first thing to get us pumped out. Here's my card for the "get punchy" challenge. This card uses the Filmstrip Technique idea from the TJNL, except, I used my SU Spiral Punch to create the look of a filmstrip. Great cards! 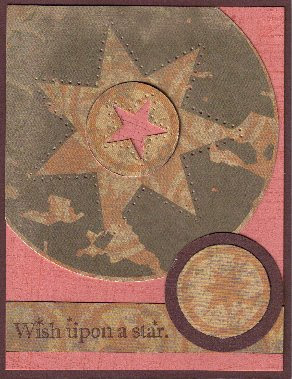 Love your mom's idea of punching the star and backing with different cardstock. And the filmstrip on your card is always a "wow"! Both cards are fabulous! Gerrie brought elegance to that star and the layout is so great. Lisa! Santa is a star on your cards...that spiral punch is awesome! Great idea on the filmstrip, Lisa -- Why oh shy are you trying to get me to buy that set??? I love Gerrie's card, too -- it is spectacular. I see where you get your talent! Your mom's card is beautiful! I love your film strip santa idea too! I had never seen the filmstrip technique. VERY CUTE! Your mom's card is lovely. Good job, girls! The filmstrip is so fun....as all your cards are, this card is fabulous! And I love your Mom's card as well! Very dramatic. Both samples are wonderful!! I agree with Pat...stop making me what that set! Great use of the spiral punch with that set! BOTH cards are absolutely wonderful! How nice to see some of your Mom's creations too! great cards - love the colors in your mom's card! love the filmstrip tech too - need to remember that!! How fun...love both cards and how lucky for you to have such a crafty mom! Wow... Lisa... fabulous as usual! Love yours... Love Mom's... think I've told you before... you are so lucky to have a mom with which to share your passion! These are both great cards. 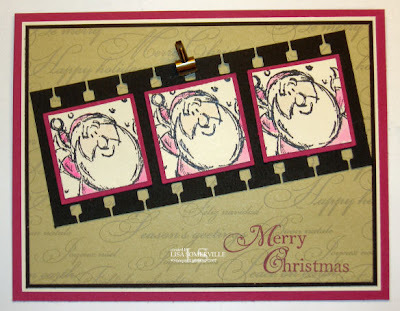 The filmstrip technique is perfect with the Santa stamp! Two very beautiful cards! I especially love the filmstrip effect! I love ur santa card so cute! what a great way to use that punch also! You know I dig that film strip look you've created! And your mom's card is gorgeous. Both cards are so cute. I love the little film strip Santa!